What do Arnold Schwarzenegger, Rob Reiner and Howard Jarvis have in common? They all played leading roles in political dramas directed by Mollrich Communucations. Howard Jarvis was a man on a mission. In 1977, he tried twice and failed to place a measure on the California ballot limiting property taxes. He succeeded in his third attempt, which became known as Proposition 13. Howard soon learned what it truly means to “fight city hall.” Every public sector union, most major corporations and nearly every politician joined forces to fight Proposition 13. Ten weeks before Election Day the YES on 13 campaign was out of money and falling behind in the polls. Howard Jarvis turned to the partners of Mollrich Communications. Mollrich Communications did something that had never been done before in California – they overcame a multi-million dollar opposition campaign by appealing directly to the public for financial support – and it worked. By matching the voter file to assessor property tax files, Mollrich Communications were able to send mailers telling millions of property owners exactly how much they would save under Proposition 13 and asked the voters to donate a portion of their future savings to the campaign. The overwhelming response to this appeal enabled the YES on 13 campaign to actually outspend the NO side on television in the final weeks of the election, resulting in a 2 to 1 victory and a place in history. Arnold Schwarzenegger entered politics with massive star-power, but without the dedicated base of grassroots supporters that traditional politicians cultivate over many years. Mollrich Communications solved that problem nearly overnight by creating the “Join Arnold” program. Driven by an aggressive direct mail and Internet campaign, Join Arnold raised millions of dollars and produced thousands of voters for Arnold Schwarzenegger. In the governor’s successful 2006 re-election campaign, Mollrich Communications managed a micro-targeted direct mail effort that produced more than 30 special mailings to carefully selected groups of voters. Governor Schwarzenegger staged a dramatic come-from-behind victory and was re-elected by a landslide vote of 56% to 39%. Proposition 10 created a 50 cent per pack tax on cigarettes in order to provide funding for early childhood services throughout California. The campaign was chaired by Rob Reiner, a longtime children's advocate, and featured star-power and bipartisan support not often seen in California politics. 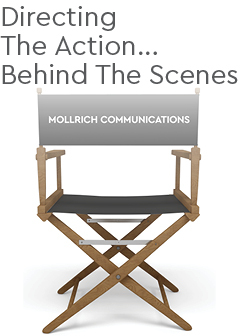 Mollrich Communications worked with Rob Reiner to research and draft Proposition 10 and produced direct mail, print and broadcast ads for the campaign. Television and radio spots featured prominent proponents of the measure, including Surgeon General C. Everett Koop, Charleton Heston, Martin Sheen and Rob Reiner, as well as strong messages supporting the initiative and against the tobacco industry. Proposition 10 passed with 50.5% of the vote in spite of being outspent by a margin of over 6-1. Proposition 10 provides $590 million per year for a wide range of education, healthy nutrition and anti-smoking programs directed at young children and their parents. LEARN, a non-profit organization representing more than 600 major corporations and community groups, retained Mollrich Communications to develop a grassroots lobbying campaign to promote passage of a comprehensive plan to reform Los Angeles public schools. The LEARN campaign featured actor Edward James Olmos as a spokesman in English and Spanish radio spots, television spots and movie trailers encouraging citizens to call an 800 number and receive a school reform kit, which contained a petition to the school board demanding adoption of the LEARN program. Newspaper ads in English, Spanish, Chinese, Japanese, Korean, and Filipino delivered the same message to the many diverse ethnic communities that make up Los Angeles. In addition, one million pieces of direct mail were sent to voters explaining the LEARN program in detail and asking for petitions to be sent to the school board. Returns from the mailings indicated overwhelming public support for LEARN. Mollrich Communications also helped to create the broad-based coalition, consisting of business and community leaders, educators, ethnic and labor organizations, and elected officials, that made the LEARN program a resounding success. The city of Irvine retained Mollrich Communications in 1999 to conduct a public information and education campaign on the reuse of the recently closed Marine Corps Air Station El Toro. When Mollrich Communications was retained, 55% of likely Orange County voters were in favor of building an international airport at the base. The residents of Irvine and south Orange County were almost unanimously opposed. Mollrich Communications developed a media campaign utilizing direct mail, radio, cable television, videos, and the Internet designed to educate the public about an alternative to an El Toro airport plan – the creation of a great metropolitan park. Mollrich Communications also established a coalition of advocacy groups, elected officials from throughout Orange County, and business and community leaders to further the cause of non-aviation uses for the El Toro property. This process led to the drafting of a legislative initiative by the city known as Measure W, which zoned the base for non-aviation use. Measure W was passed by 58% of voters in the March 2002 election. Following the election, the federal government put the base up for auction. Mollrich Communications advised the city on a reuse strategy that resulted in the city receiving 1,500 acres and more than $400 million from a developer to use for the design, construction and operation of the Great Park.